I used to know a woman who was oppressed by her mother-in-law. This mother-in-law was jealous of women more educated than she and felt insecure if her son’s new bride was praised by others. She did whatever she could to frustrate the new bride and brainwashed the family, saying if they praised the young woman she would become too proud and would stop working hard to satisfy the family’s expectations. She spun stories about the young woman. The bride could cook, decorate the home and sew, and she was well educated. In order to keep her new family happy she made the breakfasts and cleaned the large house, taking care of every angle, from fridge to garden to garage. Each day she did the housework, but before her husband returned home, she would take a shower, put on nice clothes and makeup, making sure she showed no sign of how busily she had passed the day. Jealous of her daughter-in-law’s talents, the mother-in-law convinced her son that his young bride must leave her friends at her university and attend one nearby. She told him his wife might start having affairs with boys on campus. Next, she prevented the girl from visiting her father’s home and she wasn’t allowed to stay at her other relative’s homes. When her family asked her why she’d stopped visiting, she explained the situation minimally, but begged them not to intervene, fearing that if they did things would only get worse. Believing things would get better, the bride tried her best to keep everyone happy. She imagined that one day she would cook a meal that would finally please her mother-in-law. But every morning she was disappointed. She asked her husband to tell her what was wrong with her, what she lacked, and what she was doing to make him and his family so unhappy. In response, the husband painted an image of her as an undisciplined, witchy, childish, and good-for-nothing woman. He commanded her to keep his family happy and threatened to send her back to her father’s house if she failed, which would bring great shame on her family. The bride was in shock. Her husband’s cruel words echoed in her mind and made her weep all night. She had no one to help or advise her except God, to whom she prayed, seeking help. One day courage came to her and she took a stand against her mother-in-law, rejecting her hurtful words and refusing to take the blame for her problems. Her husband hit her. She felt she had no choice but to leave the house and seek a divorce and she fled to her father’s house. Her family was shocked by her return and by the news of what had happened to her. She had hidden her problems from them out of faith that things would improve. She told them everything and her family supported her decision to get a divorce. With a broken heart, the young woman approached her father-in-law to talk to him about the divorce. He was happy to see her and when he heard her stories, the old man began to cry. He said he couldn’t live with the woman either. He asked his daughter-in-law to forgive what had happened to her and asked her what she wanted to do now. The bride said she wanted a divorce. The father-in-law said, “Is it so serious that you two have to split up?” He said his son was a good man with a soft heart, but misled by his mother. The father said his son had trusted his mother for years, but he has spent just one year married. He asked the girl to not seek a divorce. “One day, maybe after I am gone, you will see that he is a good man, and you will be happy together. These others who give you problems will either give up or go away once they understand that you two are loving friends and a supporting couple.” He said he would keep an eye on the situation and help. The bride was humbled, and she promised her father-in-law that she would take his advice. She returned to her husband’s house. It took her one year to overcome her problems, but one day she found that everything was working out just as her father-in-law had predicted. Her father-in-law continued to counsel her as long as he could, never disclosing to anyone that he had advised his daughter-in-law. Women can be as cruel to each other as men can be to them. In a society in which women have few opportunities to claim power, some women decide to use what little power or authority they have to control and oppress other women. In seeking to gain power for ourselves, we women must support one another, and not turn against each other the way some mothers-in-law do. Mothers-in-law are a problem in all cultures when they are jealous and seek to prove they are still the most important woman in their sons’ lives. The picture you paint here was encouraging in the help offered by a sympathetic father-in-law and the patience of the young wife. However, I’m not sure how many wives who experienced this would continue to work so hard to improve things. Her efforts are commendable. 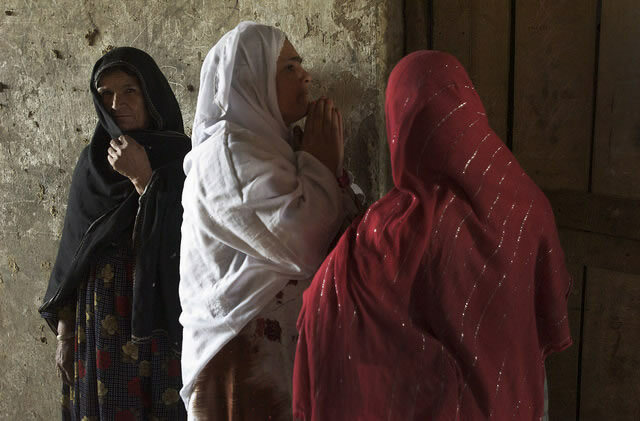 Your explanation of why this happens in Afghanistan is understandable and I hope more and more women will see the importance of giving loving support to one another in all areas of life. Thank you for sharing this story. Thank you for sharing the story about this inspirational woman. I am reading Thousand Splendid Suns by Khaled Hosseini, and even from this book and from all the stories on this site, I always thought only about how women were being abused by men. I never really thought about how women would abuse other women because they had no power over men. I think that she was really brave to give her husband another chance, even though he said hurtful things to her and beat her. It was so sad about how women did not stick together and oppressed other women. I agree with this conclusion about how women should stick together so that they can become more powerful as one group instead of picking on other women who are less powerful. Her father-in-law is really a great man for helping her. This girl was really brave and this story has a happy ending that can inspire other women to act in the same way. I really hope that all women can experience this happy ending, too.